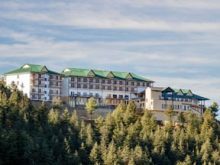 Nestled amidst thick Cedar forests and spread over five acres, every nook and corner of the hotel offers mesmerising views of the mighty Himalayas. Taj Theog Resort & Spa’s design and architecture echoes colonial charm reminiscent of hill station appeal. Each of the 99 rooms, with warm wooden furniture, traditional rugs and tall French windows offer spacious balconies overlooking snow peaks and quaint villages. Guests have a choice of distinctive culinary options which include an all-day diner – Tragopan that offers the robust Pahari cuisine along with global cuisines and comfort food; Peony, the oriental restaurant offers Sichuan and Cantonese cuisines.